Have you ever used a tuning fork? This tool is a very versatile instrument that can be used for many different healing processes. For those who are unaware, a tuning fork is a two-pronged metal fork that can be used as an acoustic resonator. Traditionally, this tool has been used to tune musical instruments. Tuning forks work by releasing a perfect wave pattern to match a musician’s instrument. This same wave pattern can also be used in medical situations. In the medical profession, tuning forks remain a preferred method of testing for certain types of hearing loss. Testing for hearing loss with a tuning fork is called a Rinne test. The Rinne test involves a doctor placing a humming tuning fork near the patient’s skull. The doctor will then place the fork near the patient’s ear. Using a stopwatch, the doctor will time how long the patient can hear it by the skull and the ear. If the patient feels the fork more through the jaw than they can hear it through the ear there is a problem conducting soundwaves. In addition to hearing loss, the tuning fork can be used to evaluate a wide range of other health problems. If X-rays are in short supply, doctors will use tuning forks to identify whether a bone is fractured or not. Doctors do this by simply striking a tuning fork and placing the vibrating fork close to the affected area. 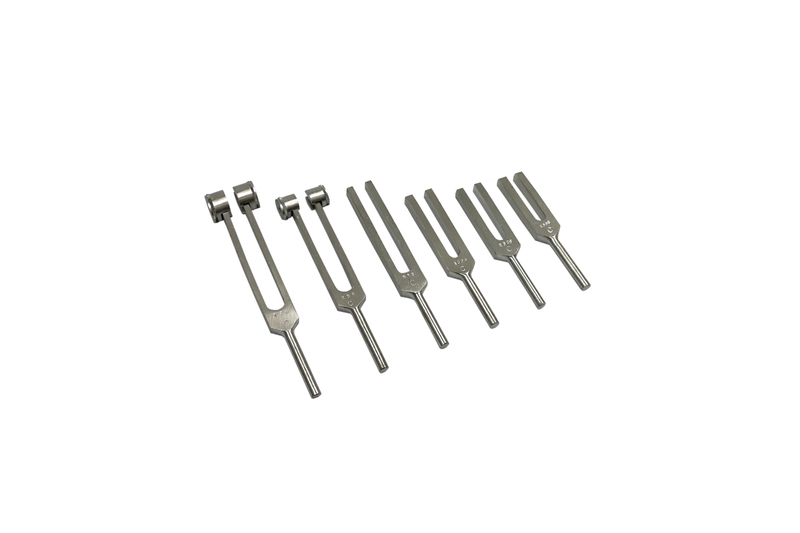 Tuning forks can also provide sound therapy which helps induce a deeper state of relaxation. The soundwaves the fork produces restores the balance in the body’s chakras, keeping the muscles, nervous system and organs in perfect harmony. Using a tuning fork for sound therapy is one of the best techniques to achieve total relaxation. The tuning fork is a great and non-invasive healing tool. It can used for several healing and evaluation practices including: Rinne tests, X-rays and sound therapy. Next time you go see a doctor, you may have tuning fork used on you. For more information on Tuning forks, click here.